Only One Opportunity Remains at The Brannan! Contact Molly Barnes at 919-973-1516 to learn about one remaining opportunity at The Brannan! 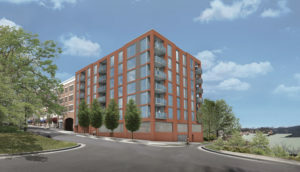 The Brannan offers Downtown Durham living at its finest. Homes feature a floor-to-ceiling fully retractable glass door/screen/shade opening onto an expansive terrace, with 5” wide hardwood floors throughout living areas and master suite. Kitchens include Bosch appliances, Grohe fixtures, quartz countertops, and under cabinet LED lighting. Individual storage units and secured assigned parking are included. Walk to the area’s hippest shops, restaurants, and festivals, or stroll through Central Park and the Farmer’s Market.